Reading and share top 17 famous quotes and sayings about Science And Humanity by famous authors and people. 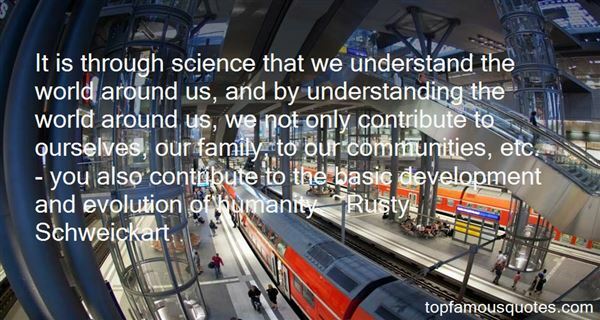 Browse top 17 famous quotes and sayings about Science And Humanity by most favorite authors. 1. "To oppose knowledge is ignorant, and he who detests knowledge and science is not a man, but rather an animal without intelligence. For knowledge is light, life, felicity, perfection, beauty and the means of approaching the Threshold of Unity. It is the honor and glory of the world of humanity, and the greatest bounty of God. 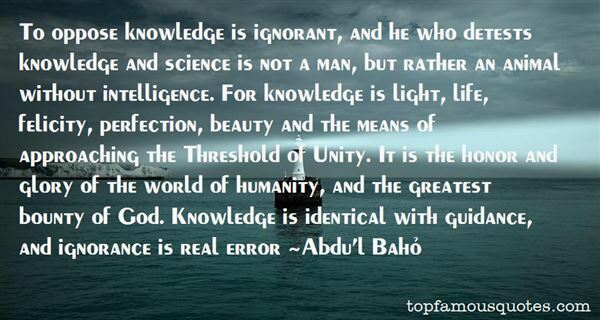 Knowledge is identical with guidance, and ignorance is real error"
2. "I was accused of being against civilization, against science, against humanity. naturally, i was flattered and at the same time surprised, hurt, a little shocked. he repeated the charge. but how, i replied, being myself a member of humanity (albeit involuntarily, without prior consultation), could i be against humanity without being against myself, whom i love - though not very much; how can i be against science, when i gratefully admire, as much as i can, thales, democritus, aristarchus, faustus, paracelsus, copernicus, galiley, kepler, newton, darwin and einstien; and finally, how could i be against civilization when all which i most willingly defend and venerate - including the love of wilderness - is comprehended by the term"
3. "Science, its imperfections notwithstanding, is the sword in the stone that humanity finally pulled. The question it poses, of universal and orderly materialism, is the most important that can be asked in philosophy and religion." 4. "Science taps the power of human understanding to look at the world and figure out how it works. It can't fail without humanity itself failing. Your magic could turn off, and you would hate that, but you would still be you. You would still be alive to regret it. But because science rests upon my human intelligence, it is the power that cannot be removed from me without removing me. Even if the laws of the universe change on me, so that all my knowledge is void, I'll just figure out the new laws, as has been done before. It's not a Muggle thing, it's a human thing, it just refines and trains the power you use every time you look at something you don't understand and ask 'Why?" 5. "Holiness must have a philosophical and theological foundation, namely, Divine truth; otherwise it is sentimentality and emotionalism. Many would say later on, 'We want religion, but no creeds.' This is like saying we want healing, but no science of medicine; music, but no rules of music; history, but no documents. Religion is indeed a life, but it grows out of truth, not away from it. It has been said it makes no difference what you believe, it all depends on how you act. This is psychological nonsense, for a man acts out of his beliefs. Our Lord placed truth or belief in Him first; then came sanctification and good deeds. But here truth was not a vague ideal, but a Person. Truth was now lovable, because only a Person is lovable. Sanctity becomes the response the heart makes to Divine truth and its unlimited mercy to humanity." 6. "In scattering the seed, scattering your 'charity,' your kind deeds, you are giving away, in one form or antoher, part of your personality, and taking into yourself part of another; you are in mutual communion with one another, a little more attention and you will be rewarded with the knowledge of the most unexpected discoveries. You will come at last to look upon your work as a science; it will lay hold of all your life, and may fill up your whole life. On the other hand, all your thoughts, all the seeds scattered by you, perhaps forgotten by you, will grow up and take form. He who has received them from you will hand them on to another. And how can you tell what part you may have in the future determination of the destinies of humanity?" 7. "And if ever the suspicion of their manifold being dawns upon men of unusual powers and of unusually delicate perceptions, so that, as all genius must, they break through the illusion of the unity of the personality and perceive that the self is made up of a bundle of selves, they have only to say so and at once the majority puts them under lock and key, calls science to aid, establishes schizomania and protects humanity from the necessity of hearing the cry of truth from the lips of these fortunate persons." 8. "Today, for the mass of humanity, science and technology embody 'miracle, mystery, and authority'. Science promises that the most ancient human fantasies will at last be realized. Sickness and ageing will be abolished; scarcity and poverty will be no more; the species will become immortal. Like Christianity in the past, the modern cult of science lives on the hope of miracles. But to think that science can transform the human lot is to believe in magic. Time retorts to the illusions of humanism with the reality: frail, deranged, undelivered humanity. Even as it enables poverty to be diminished and sickness to be alleviated, science will be used to refine tyranny and perfect the art of war." 9. "Modern civilization depends on science … James Smithson was well aware that knowledge should not be viewed as existing in isolated parts, but as a whole, each portion of which throws light on all the other, and that the tendency of all is to improve the human mind, and give it new sources of power and enjoyment … narrow minds think nothing of importance but their own favorite pursuit, but liberal views exclude no branch of science or literature, for they all contribute to sweeten, to adorn, and to embellish life … science is the pursuit above all which impresses us with the capacity of man for intellectual and moral progress and awakens the human intellect to aspiration for a higher condition of humanity. [Joseph Henry was the first Secretary of the Smithsonian Institution, named after its benefactor, James Smithson.]" 10. "I don't know if science and reason will ultimately help guide humanity to a better and more peaceful future, but I am certain that this belief is part of what keeps the 'Star Trek' fandom going." 11. "The truly apocalyptic view of the world is that things do not repeat themselves. It isn't absurd, e.g., to believe that the age of science and technology is the beginning of the end for humanity; that the idea of great progress is delusion, along with the idea that the truth will ultimately be known; that there is nothing good or desirable about scientific knowledge and that mankind, in seeking it, is falling into a trap. It is by no means obvious that this is not how things are." 12. "Since the war I have stressed altogether five main objectives. The true union of Europe; the union of government with science; the power of government to act rapidly and decisively, subject to parliamentary control; the effective leadership of government to solve the economic problem by use of the wage-price mechanism at the two key-points of the modern industrial world; and a clearly defined purpose for a movement of humanity to ever higher forms." 13. "I have an idealistic view of science as a liberalising and progressive force for humanity." 14. "Religion closes off the central questions of existence by attempting to dissuade us from further enquiry by asserting that we cannot ever hope to comprehend. We are, religion asserts, simply too puny. Through fear of being shown to be vacuous, religion denies the awesome power of human comprehension. It seeks to thwart, by encouraging awe in things unseen, the disclosure of the emptiness of faith. Religion, in contrast to science, deploys the repugnant view that the world is too big for our understanding. Science, in contrast to religion, opens up the great questions of being to rational discussion, to discussion with the prospect of resolution and elucidation. Science, above all, respects the power of the human intellect. Science is the apotheosis of the intellect and the consummation of the Renaissance. Science respects more deeply the potential of humanity than religion ever can." 15. "It is through science that we understand the world around us, and by understanding the world around us, we not only contribute to ourselves, our family, to our communities, etc. - you also contribute to the basic development and evolution of humanity." 16. 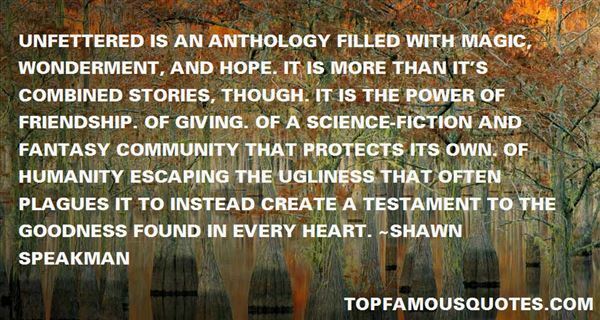 "Unfettered is an anthology filled with magic, wonderment, and hope. It is more than it's combined stories, though. It is the power of friendship. Of giving. Of a science-fiction and fantasy community that protects its own. Of humanity escaping the ugliness that often plagues it to instead create a testament to the goodness found in every heart." 17. "Edwin Land of Polaroid talked about the intersection of the humanities and science. I like that intersection. There's something magical about that place. There are a lot of people innovating, and that's not the main distinction of my career. The reason Apple resonates with people is that there's a deep current of humanity in our innovation. I think great artists and great engineers are similar in that they both have a desire to express themselves. In fact some of the best people working on the original Mac were poets and musicians on the side. In the seventies computers became a way for people to express their creativity. Great artists like Leonardo da Vinci and Michelangelo were also great art science. Michelangelo knew a lot about how to quarry stone, not just how to be a sculptor." Even those who write against fame wish for the fame of having written well, and those who read their works desire the fame of having read them."